I understand that you are interested in information about Nicholas Mamer. 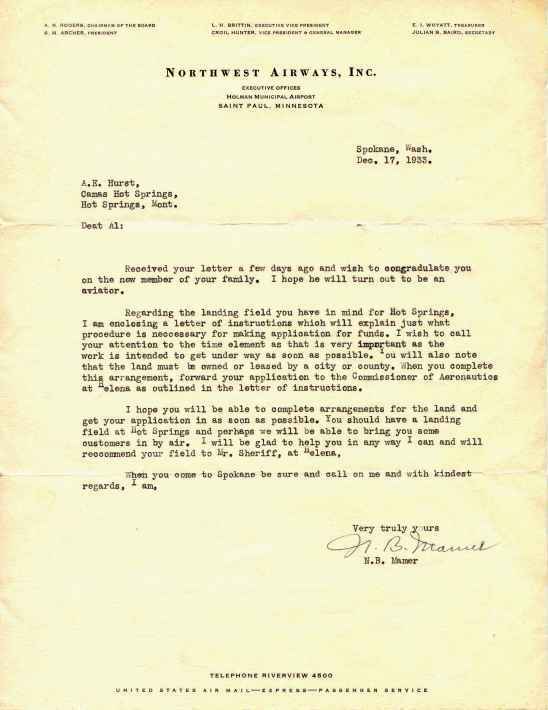 I am attaching a letter my father received from him in 1933 shortly after I was born. My father had contracted with the Salish Indian tribe for developmental rights to the hot springs present in the town. As a part of that, he was interested in creating an airport possibly to increase traffic to the area for the healing effects of the mineral springs. Not sure how valuable this is to you, but it does speak to a bit of history of early aviation in the area. PS: For what it is worth, I did become an Air Force pilot. ONLINE RESOURCES If you search for "Nick Mamer", using the Google search engine, (6-6-06), you will find 47 links. Most of them are well worth visiting and offer a wealth of information about his life and career. National Smokejumpers Association This website offers a very complete and detailed revue of Nick's activities in aerial fire patrols. It includes many stories of his experiences and is highly informative. You can access the page by clicking on the title above. Former Local Pilot Uses Field for Landing Huge Tri-Motored Ship On this page will be found an article from the Oct 30, 1930, Kennewick, Wa. Courier Reporter which reports the landing of Nick's Ford tri-motored monoplane "West Wind," owned by the Mamer Transport Co., of Spokane. There are several other newsclippings on the same page. You can access the page by clicking on the title above. 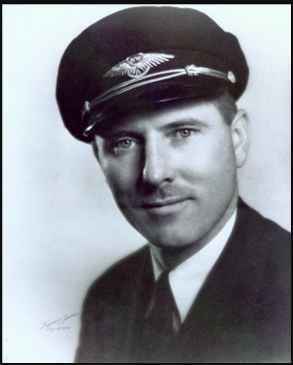 Jan 10, 1938 while flying as chief pilot for Northwest Airlines on a Lockheed Model 14-H Super Electra from Seattle to Minneapolis, when parts of the tail section were torn off about 15 miles north of Bozeman, Montana, the plane went into a dive, and Mamer, the copilot and eight passengers were killed instantly. The tail section had failed because of a new design from what is known as 'natural resonance or period of vibration.'"